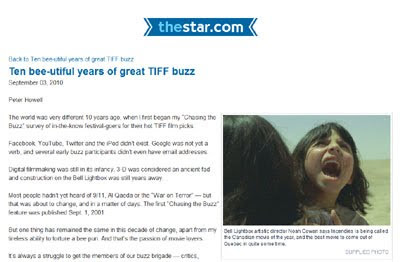 Once again, we're very happy to be invited by Peter Howell, Toronto Star movie critic, for his annual Chasing the Buzz poll – celebrating it's 10th anniversary! A panel of critics, programmers, and movie-buffs, name the 3 films they are most looking forward to. Peter Howell's "Ten bee-utiful years of great TIFF buzz" will be published as the entertainment section cover-story, for tomorrow's Toronto Star (Saturday Septmeber 4, 2010).